Die Photographische Sammlung presents Plant Studies by Karl Blossfeldt and Related Works, an exhibition presented by Die Photographische Sammlung/SK Stiftung Kultur, Cologne in co-operation with the Berlin University of the Arts, compiled by Gabriele Conrath-Scholl, Rajka Knipper and Claudia Schubert. 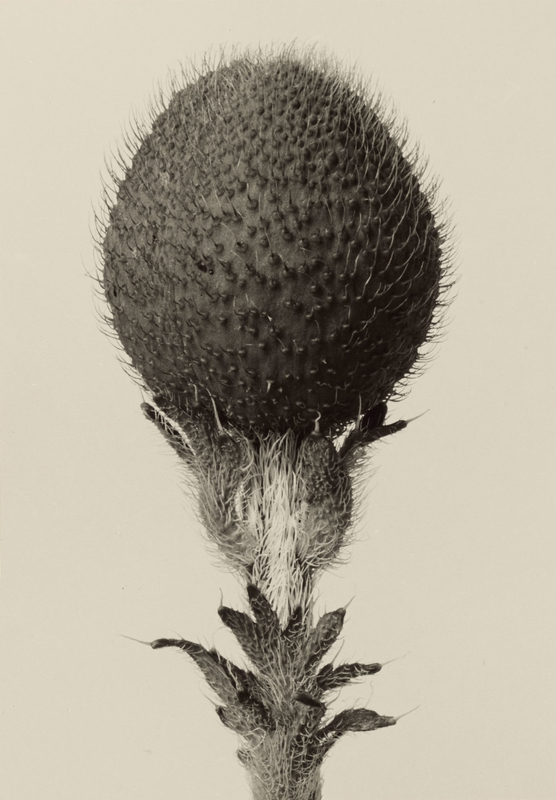 The exhibition will present for the first time in this volume the famous and influential plant studies by Karl Blossfeldt (1865-1932) from the collection of the Berlin University of the Arts as original prints. 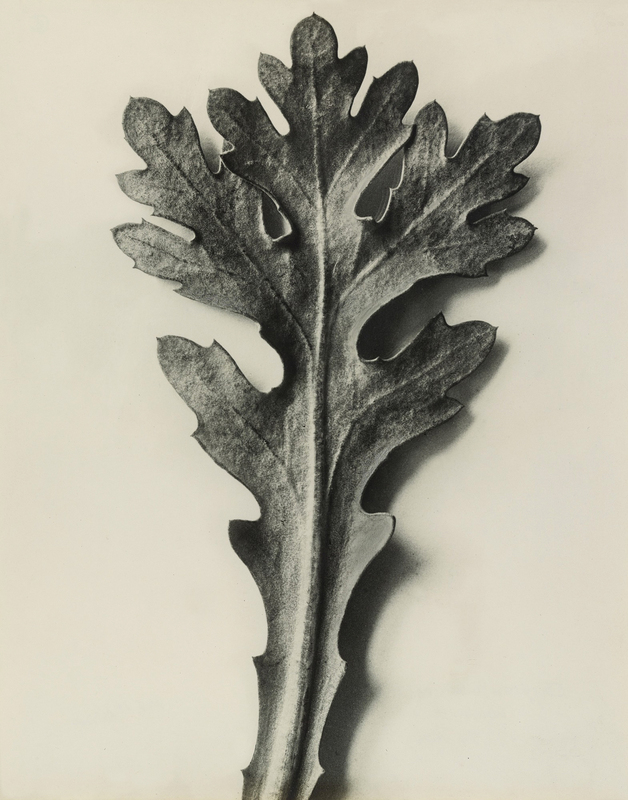 Blossfeldt’s photographs will be accompanied by the artist’s herbaria and sculptures based on plants, the latter produced in cooperation with his teacher Moritz Meurer. The amalgamation and presentation of the various groups of work from the Berlin Blossfeldt collection provides detailed insight into the working style of the artist, who taught the study of natural forms in Berlin for over thirty years. 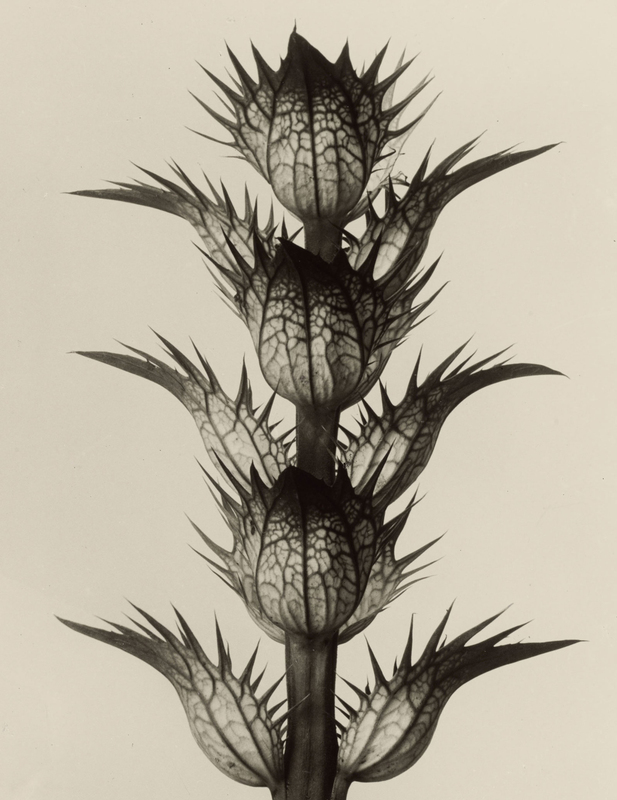 His plant photographs were used primarily as reference aids during lessons in his classes. It was only towards the end of his working life that his photographs became known to the larger public through an exhibition at the Galerie Nierendorf in Berlin in 1926.The publication of the book Art Forms in Nature in 1928 led to an ongoing appreciation of his photographs. Karl Blossfeldt developed in year-long concentration on one theme a highly aesthetic picture language which up until today still fascinates the viewer with its clarity and focus on the object. The exhibition highlights the topic of plant studies against a background of research into form and structure using selected historical and contemporary works. They mirror the development and technical possibilities of the medium, as well as the artistic reflection into their characteristics and decorative aspects. Thus the scope of the 300 exhibits reaches from detailed analyses of the form of individual botanical structures to the documentation of complex natural and populated areas, up to a symbolic contemplation of plants. The exhibition is the result of years of cooperation between the Universität der Künste Berlin and Die Photographische Sammlung/SK Stiftung Kultur, two institutions committed to the ongoing academic study and extensive public presentation of the Karl Blossfeldt collection in the possession of the Universität der Künste. The presentation gives Die Photographische Sammlung once again an opportunity to draw attention to its own institutional orientation. 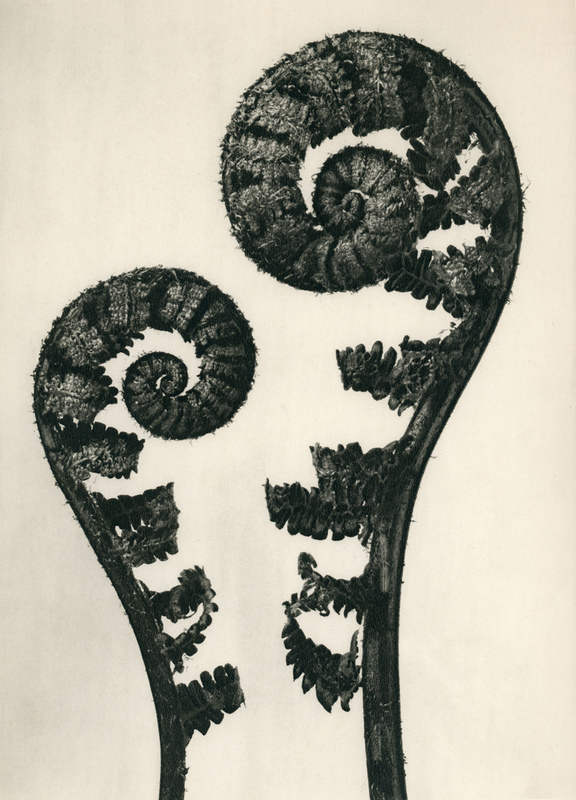 In addition to the co-operation on the work by Karl Blossfeldt these include avant-garde objective and conceptual photographic works, which developed in particular in line with the sense of a new era in the 1920s and the 1960s/1970s or are artistically related to them. Works which the Cologne institution purchased during the past years in connection with the botanical subject or were obtained as permanent loans, are now part of the current presentation. They include works by Pietro Guidi, August Kotzsch, Paul Dobe, works from the Folkwang-Auriga Verlag, by Fred Koch, Albert Renger-Patzsch, Else Thalemann, August Sander, Ruth Lauterbach-Baehnisch, Ruth Hallensleben, Dr. Herbert W. Franke and Lawrence Beck. Although works by the younger artists Natascha Borowsky and Simone Nieweg are already part of the collection, in light of their more recent work both artists have made photographs from their own collections available for the show. The current show is a thematically oriented insight into Die Photographische Sammlung’s collection which ranges from the historical to the contemporary and in the last few years has been extended by a number of corresponding groups of photographic works. 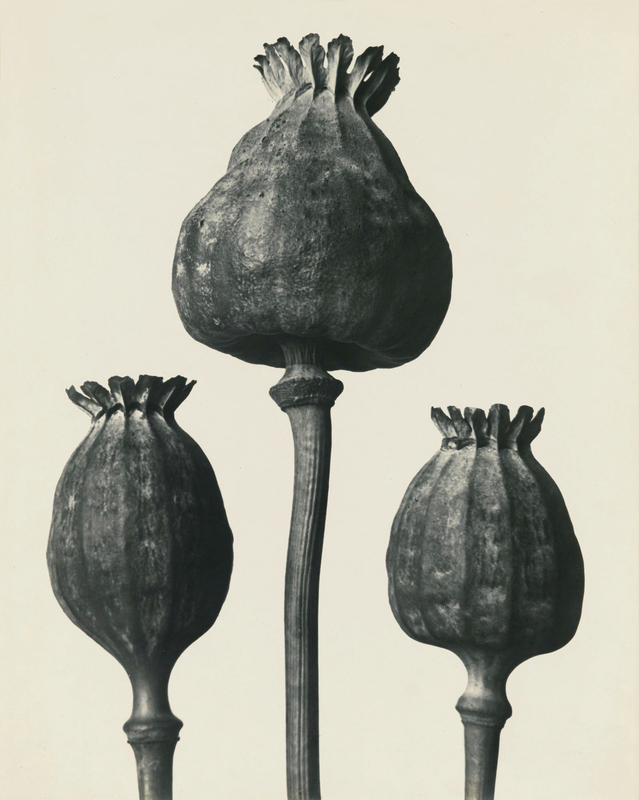 In order to provide a comprehensive, but lively background to Karl Blossfeld’s work and to display illuminative positions, which were frequently mentioned in connection with the reception of Blossfeldt’s work, but were rarely, if ever, presented together in exhibitions, and also to permit new assessments and links, important loans have been integrated into the exhibition. They have been borrowed from the Karl-Blossfeldt-Archiv/Ann and Jürgen Wilde, Zülpich, which contains the largest collection of original photographs by the artist. Karl Blossfeldt received essential support from Moritz Meurer (1839-1916) who worked as a graphic artist and painter, and for whom Blossfeldt worked as an assistant in Rome from 1892 to 1895. On the basis of Meurer’s concept, reference aids in the form of sculptures and drawings, as well as photographs, were developed for later use in lessons. 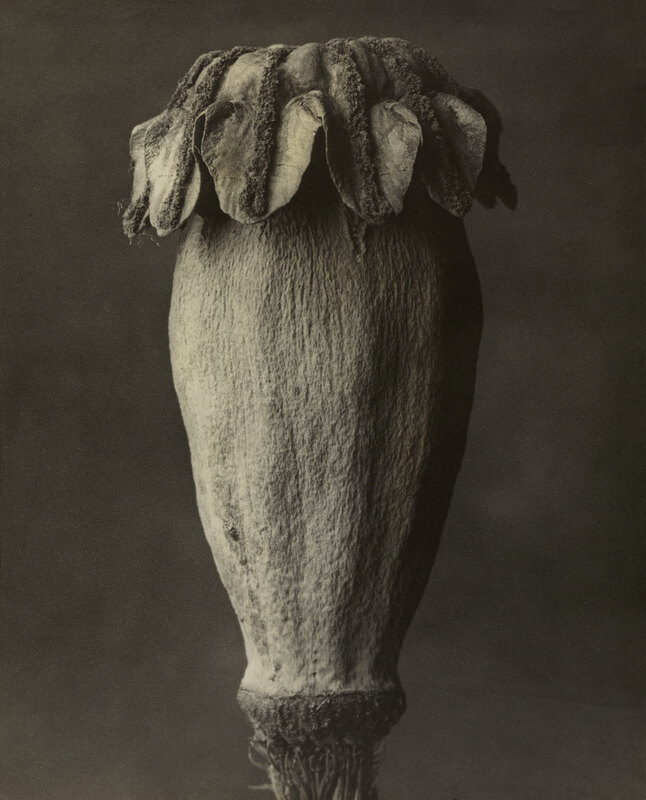 Meurer’s idea, to take the basic forms in nature, which could be seen in the composition of a plant, as models for architecture, artistic and craftwork objects or ornaments, was integrated by Blossfeldt into his photographs. According to the records, attention was drawn to Karl Blossfeldt’s work in particular by the fact that the Berlin gallerist Karl Nierendorf heard about his work and presented the first exhibition of his photographs outside the school context in 1926. The plant photographs, still under the influence of the ornamental art nouveau although more as a reaction to it were highly appreciated in the early days of New Objectivity. These studies seemed to put into practice the newly formed principles contained in the art of the 1920s, in which there was a demand for things to be presented without artistic digression, in a clear, authentic pictorial language, at the same time providing insight into their nature. It is therefore even more surprising that Blossfeldt was able to achieve this so easily, considering that he accomplished it seemingly uninfluenced by questions of artistic or photographic history categories. His motivation stemmed from his didactic and pragmatic aims to depict plant forms with precise accuracy, in order to provide flawless reference aids which would encourage his students to transform them artistically. His straightforward, passionate concentration on one theme, which he almost endlessly varied within a limited field, opened it up for comparative viewing. In particular since the 1970s, in the light of a new-orientation of the medium, his work was highly regarded and gained indirect influence on contemporary art, to the extent that knowledge of his images influences today s viewing perspectives. On the occasion of the exhibition Plant Studies by Karl Blossfeldt and Related Works Die Photographische Sammlung/SK Stiftung Kultur is presenting on its website a directory they have created of all 631 photographs, 39 herbaria and 57 sculptures from the Universität der Künste’s Karl Blossfeldt collection together with documents from the University archive. 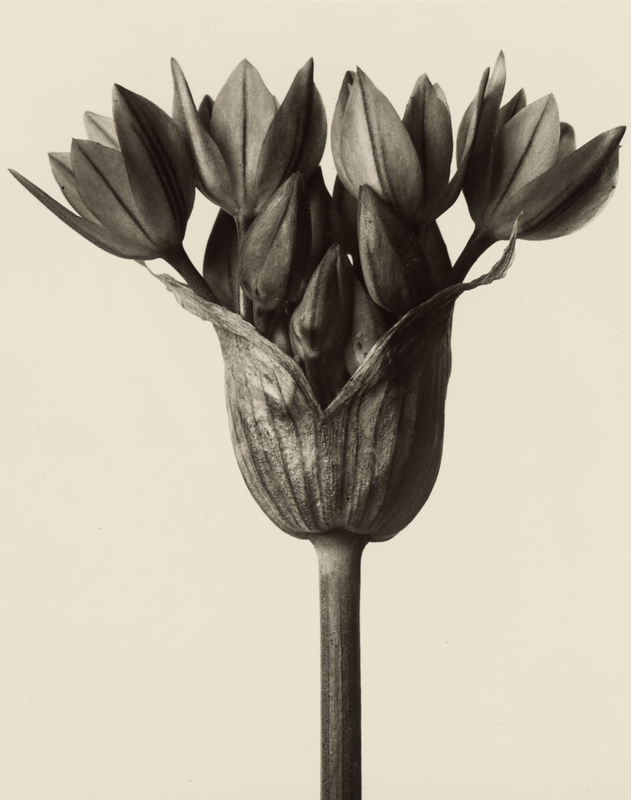 A distinctive feature of the research is the fact that every photograph is accompanied not only by a concordance of primary and secondary literature but also Blossfeldt negatives and transparencies from the Deutsche Fotothek in Dresden and, in the near future, from the Karl Blossfeldt Archive/Ann and Jürgen Wilde. The website provides a text forum on the topic, which uses selected documents to illustrate Blossfeldt’s teaching work in the context of the history of the University and includes various aspects of his reception in publications and exhibitions. “He photographed plants by the thousands – photographs which feature flowers, buds, branched stems, clusters or seed capsules shot directly from the side, seldom from an overhead view, and rarely from a diagonal perspective. He usually placed the subjects of his photographs against white or grey cardboard, sometimes against a black background. Hardly ever can details of the rooms be detected. The light for his shots was obtained from northern windows, making it diffuse, but it fell from the side, creating volume. The technique and processing conditions were very simple; only the medium size of the negative format was somewhat out of the ordinary. Nothing detracted from the subject. This man produced such pictures for over thirty years. Text by Rolf Sachse from the book Karl Blossfeldt Benedikt Taschen Verlag (April 1997) available on Amazon. Originally developed from a practice at the Unterrichtsanstalt des Königlichen Kunstgewerbemuseums Berlin [Institute of the Berlin Royal Arts and Crafts Museum] at the end of the 19th century and designed specifically for use as teaching materials, Karl Blossfeldt’s plant photographs rank today among the classic works of art and photography history. Blossfeldt taught “Modelling from Live Plants” from 1899 to 1930, first at the Unterrichtsanstalt des Königlichen Kunstgewerbemuseums, later at the Vereinigte Staatsschulen für Freie und Angewandte Kunst [United State Schools for Fine and Applied Arts] that emerged from the Unterrichtsanstalt’s amalgamation with the Hochschule für Bildende Künste [University of the Visual Arts] – predecessors of the present-day Berlin University of the Arts. A major role in the introduction of that subject was played by Moritz Meurer, for whom Karl Blossfeldt worked as a scholarship-holder in Rome from 1892 to 1895. There, prepared plant specimens, sculptures, castings, drawings and photographs were made as models for classroom use. 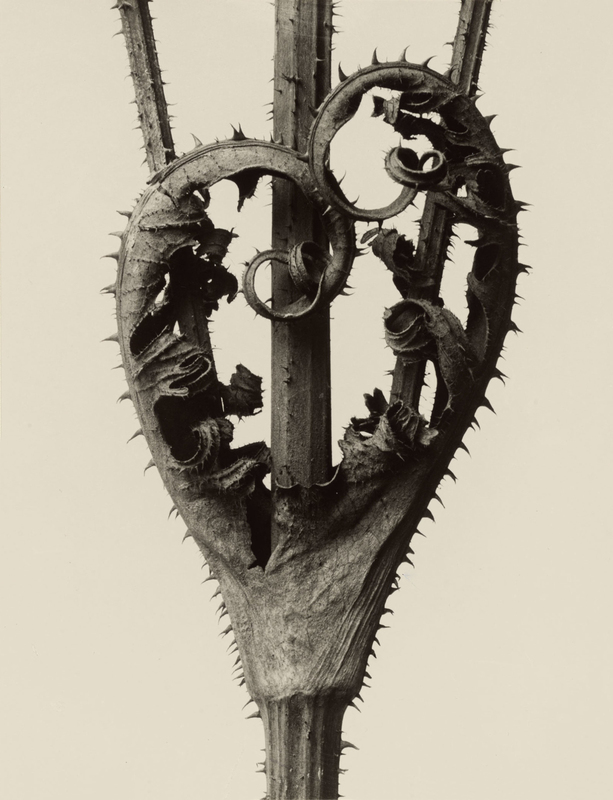 Blossfeldt took up and systematically developed Meurer’s idea of using the basic natural forms inherent in the structure of a plant for the design of architectural, art or craft objects and ornaments. There is no detailed record showing the technical facilities at Karl Blossfeldt’s disposal. The Karl Blossfeldt Archive/Ann and Jürgen Wilde and the Deutsche Fotothek in Dresden have preserved glass plates and transparencies of various formats (6/6.5 x 9 cm, 9 x 12 cm, 9 x 18 cm and 13 x 18 cm). Blossfeldt’s camera – or cameras, because he may have had several – is known to have been an entirely or partly home-made affair. The work collages in the collection of the Karl Blossfeldt Archive/Ann and Jürgen Wilde give a good idea of his negatives because the images that appear in them are from contact prints made by Blossfeldt. 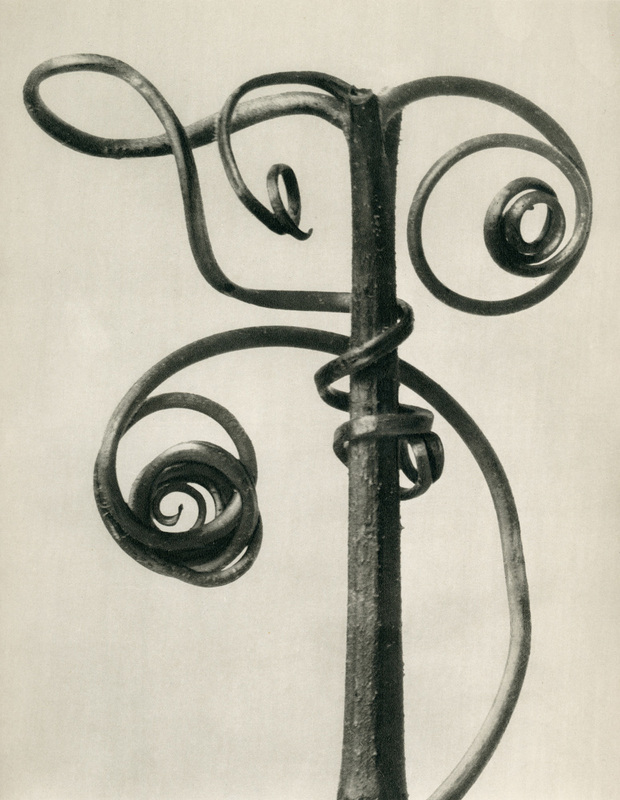 The fact that Karl Blossfeldt became a major celebrity was due to the fortunate circumstance that his photographs came to the attention of the Berlin gallerist Karl Nierendorf. He staged the first exhibition of Blossfeldt’s work in a non-school context in 1926, presenting it alongside sculptures from Africa and New Guinea and work by the artist Richard Janthur. In 1928, in another Nierendorf initiative, Urformen der Kunst [Art Forms in Nature] was published with 120 plates of plants by Blossfeldt. The book was given such a rapturous reception that the following years saw more editions published and foreign-language editions launched in English, French and Swedish. These studies were very much in tune with the new maxim of 1920s art that called for things to be represented authentically, with no artistic frills, in a clear visual idiom designed to explore and reveal their nature. The fact that Blossfeldt succeeded in this is all the more astonishing since he started out working with no thoughts of pushing forward any boundaries in art or photography. He was primarily motivated by a didactic and pragmatic intention to produce highly accurate plant images which, as models for study, would reveal natural forms to the human eye and inspire students to turn them into art. With his passionate concentration on a single subject, addressed in close-up in almost infinite variations and thus revealed for comparative examination, Blossfeldt became a highly respected figure, especially after the re-think on photography in the 1970s. As a result, he has had an indirect influence on contemporary art and knowledge of his work helps shape the way we view art today. Karl Blossfeldt did not experience his success for long. He died in December 1932, the year in which his second book Wundergarten der Natur (Art Forms in Nature) was published. The largest collections of his photographs are in the Karl Blossfeldt Archive/Ann and Jürgen Wilde, the Archive of the Berlin University of the Arts and the Deutsche Fotothek Dresden. Thanks, this was vwry informative..